It was a glum morning as we all did our final packing and loaded our cars. Another Geezer Gathering in the books. Finally, it was time to say our final good byes and hit the road. Jack and Steph were taking a southern route and would be spending the night in Tucson, Arizona while Val and I would be taking a more northerly route and would be staying in Winslow, Arizona. After returning the house keys and gassing up the 4-Runner, we were on the road out of Ruidoso by 10:00. Today’s drive was mostly through the back country on two-lane roads so it was more scenic, but a little more tiring. It was another beautiful day and after driving for a while we decided to stop in Socorro, NM for an early lunch as there wouldn’t be any large towns for a while. After lunch we drove west out of Socorro on US Highway 60 and came upon a very interesting sight. About 50 miles west of Socorro, we could see something that looked like big satellite dishes in the distance and wondered what it was. As we got closer we could see they were indeed some kind of large satellite dishes and there were a lot of them. As we came abreast of the dishes there was a turnout with some other cars parked so we pulled over. 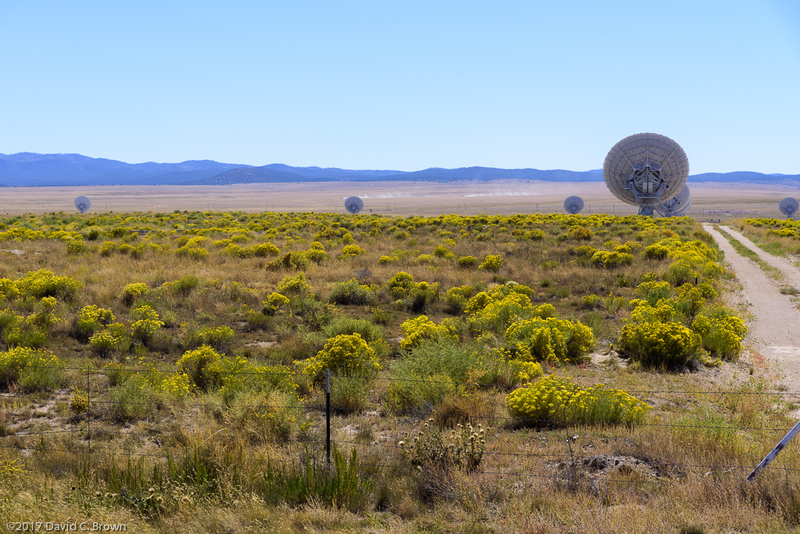 It turns out that this was the Karl G. Jansky Very Large Array Radio Astronomy Observatory. There were a total of twenty-seven large dishes mounted on railroad tracks that could be moved and positioned as needed. Evidently, they are moved quite often depending on what they were looking for and when we saw them they were spread out for miles on both side of the road. Back off the road there is a visitor center, which we would have loved to visit, but we just didn’t have time today. The area they are located in is called the Plains of San Agustin and is a beautiful area, but it was so bizarre to suddenly see these huge dishes out in the middle of nowhere. 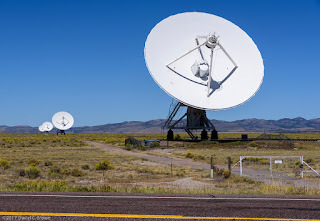 Here are a couple of links with more information - National Radio Astronomy Observatory and Wikipedia . The dishes were stretched out on both side of the road, as can be seen on this picture, and the picture below. You can see the railroad tracks used to move them in the middle on the right. The building in the distance is the Visitor Center, I wish we would have had time to stop. 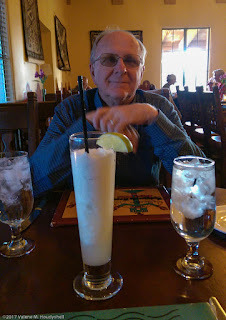 After leaving the Plains of San Agustin, we continued on to Winslow where we were spending the night at one of our favorite places, The historic La Posada Hotel. The hotel was built in 1929 and imagined by the architect as a Spanish rancho of the early 1800’s. It was renovated into a hotel when the don and his family fell on hard times. Her vision came through very well and this is a wonderful place to stay with a very interesting and historic décor. In the hotel there is a very, very good restaurant called the Turquoise Room with James Beard award nominated Chef, John Sharpe, providing the excellent cuisine. We eat in the Turquoise Room every time we stay here and have always had a wonderful dinner. Here is a link if you are interested in more detail on the history of the hotel. After dinner we walked around the hotel a bit and Val spent some time in the gift shop, but it had been a long drive so we soon called it a night and returned to our room. Today we had a relatively short drive to Laughlin, Nevada where we would spend the night at Harrah’s on the Colorado River. Just as Tehachapi is a getaway stop on almost all of our trips into the Southwest, Laughlin is a stop we almost always make on our way home. It is convenient, we get a "comped" room, it has a restaurant we like and we can get one more chance to make our fortune gambling (we never really believe that, but it’s fun to imagine). It’s a relatively short drive from Winslow to Laughlin, but we hit the road early so we could get in early. Since we didn’t eat breakfast in Winslow we decided to stop in Flagstaff for a late breakfast. I have to mention the restaurant were we ate. It was a coffee shop type restaurant, but the food was great and the service was great also. I had one of the best omelets I’ve had on the road. It's right off of I-40 so if you're looking for a place to eat while you're traveling through Flagstaff, try the Northern Pines. We arrived in Laughlin around 1:30 and after checking-in, we spent the afternoon gambling. It turned out to be a pleasant afternoon as we would lose a little and then win it back so we had a good time playing without running out of money. For dinner we ate at Guy Fieri’s Burro Borracho, which has become our favorite restaurant when we stop at Harrah’s Laughlin. It is very good Mexican food and I thought my dinner tonight was exceptionally good. After dinner we gambled a little more, but were up in our room by 9:00 as we have a long drive home tomorrow. We enjoyed our stay at Harrah’s; we had been given a suite, we had a nice dinner, and even though we didn’t come out ahead gambling, we did come home with most of our money in our pocket (unlike my unlucky stay in Las Vegas). Not much to say about the drive home, we have made this drive numerous times before and know the way well. We left Laughlin around 9:00, made one gas and lunch stop in Tehachapi (no, not at the Red House for ribs) and were home by 5:00. It felt good to be home and we are looking forward to sleeping in our own bed. The end of another great trip. Our favorite time of the year is when we meet our friends for our annual Geezer Gathering and this year was no exception. Ruidoso turned out to be a great location and the house we rented was in a great location and very comfortable. The weather turned out to be near perfect, with moderate temperatures and nearly clear skies the whole week. It was particularly interesting to learn about Billy the Kid, the Lincoln County War and the history of the area. I had no idea all that went on in this area of New Mexico. I think riding the zip line was the highlight for Val, Jack and myself as it was something we never expected to do and was a very exciting adventure for us. Most of all though, it’s the getting together of old friends that is the best part of the week. It is amazing that even though some of us only see each other once a year, we remain such good friends and have such a good time together. Next year four of us will turn 70 and we are all lucky to remain healthy and able to do this every year. We do know that no one defeats Father Time and this won’t last forever so we make the most of every year and appreciate being together, as it will not always be like this. 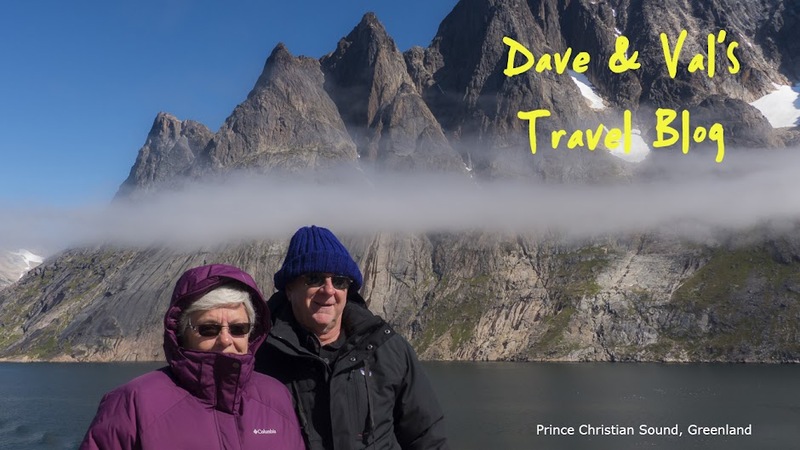 Val and I have a turn-around of less than three weeks before we start on our next trip, which is a long one. In mid-October we leave on a seven-week cruise out of Fort Lauderdale to the Mediterranean and back so we have a lot to do in a short time. Until then, we’ll see you on down the road.